Hi everyone, I hope you've all had a great week! I have a couple of El Corazons to share with you today. I got them through Hypnotic Polish, a new indie polish stockist based in The Netherlands that offers worldwide delivery! These are all from the Prisma collection, I also have a few shades from the Kaleidoscope by El Corazon Dreams About Spring that you can see here. Formula and application were pretty much flawless on all 3 shades. Nice and easy 2 coaters with no patchiness or cuticles dragging. I used 2 coats plus topcoat for each. El Corazon Prisma 423/38 is a light cool golden holo. 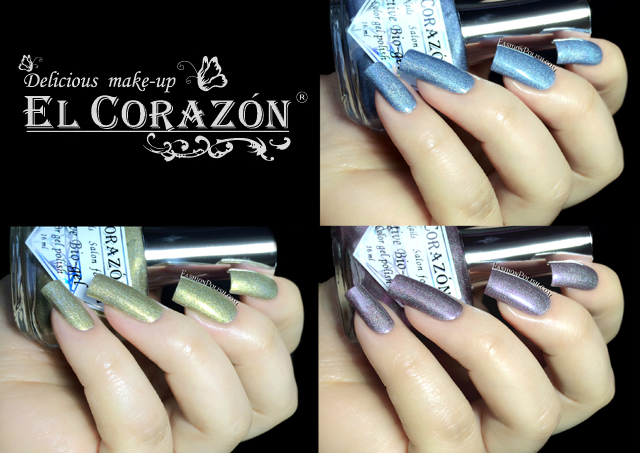 El Corazon Prisma 423/37 is a soft pastel blue holo. El Corazon Prisma 423/37 is a muted greyed out purple holo. I really love this particular type of holo, they remind me of AEngland, the blue and purple especially are beautiful!